When I was a little kid helping my mother around in the kitchen, peeling garlic would fall on me. Most likely because I just loved eating garlic, raw and cooked, haha! No, really, I love garlic. Garlic has so many health benefits and it is widely used as a natural remedy for many ailments, too. In the kitchen, it is used to give food flavor. As much as I love it, I never fancied peeling it, to be honest. The way my mom taught me was to soak garlic (especially for a big batch) in warm water, let it sit for 5 minutes and slowly peel off the skin. Later I learned that if the garlic is dry enough, you can just hold the clove from both ends and twist it like a candy wrapper. The skin will somewhat come loose and you can just remove it like an eggshell. 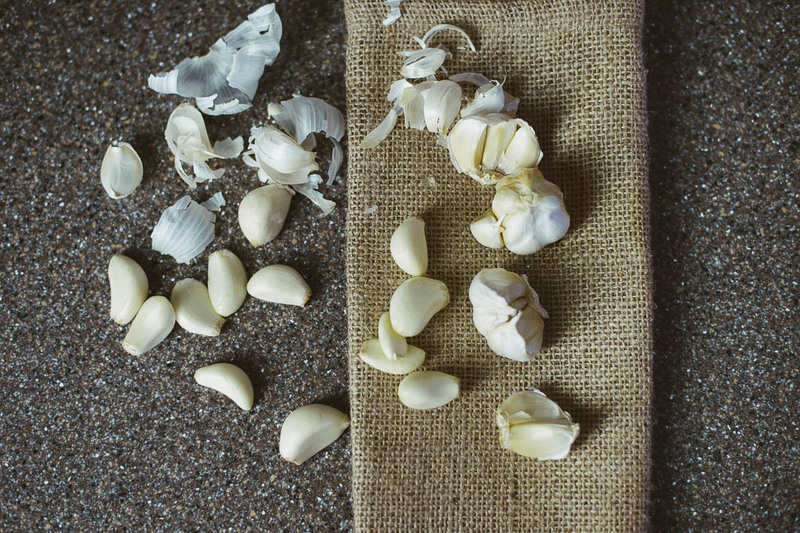 Below are two more ways you can peel garlic. 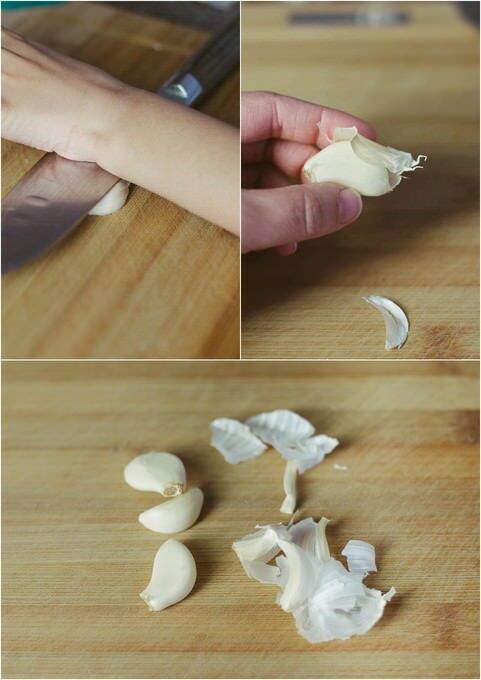 Albeit, more effective ways of peeling garlic for your culinary enjoyment. Whole bulbs of garlic should be kept in room temperature, in a dry environment that has good air circulation. Garlic will keep well in this environment for several months. The above method is best if you need a couple of cloves at a time for anything that you might be cooking. The demonstration is done by my 11-year young son. If he can do it, so can you :) Keeping the garlic bulb between your palm and the hard surface, gently agitate the top layer of the bulb. Pick up the bulb and just break it up. The cloves will come loose easily. Place each clove under a knife or a surface that has a small flat bottom. Either gently apply force on the knife (making sure the sharp side of the knife is positioned against you) or with one motion of the heel of your palm hit the area where the garlic is located. This motion will break up the shell of the clove (may break up the clove, too, a little) and you will have something to work with. This next method is the “shaker” method. 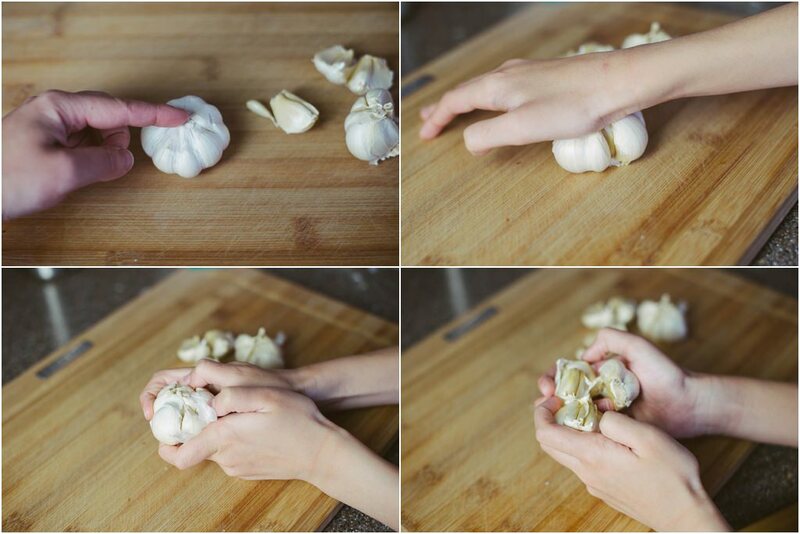 It is an absolute best method if you need a whole bunch of garlic at a time. I also use it to clean out a lot of cloves to refrigerate. That way I know that I have peeled garlic cloves if I need them while cooking. I would also recommend using more garlic than you need for a recipe. Not all the cloves will come clean with this method, and adding a few extra will guarantee that you have enough peeled cloves of garlic after you are finished. 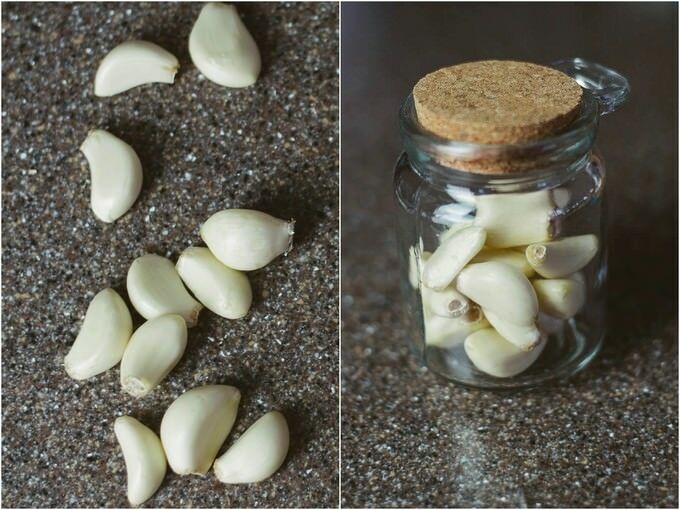 Just like you did in the above method, agitate the top of the garlic bulb, break the cloves off from the cluster, place the cloves in the mason jar, or a container with a lid and shake well for about 15-20 minutes. 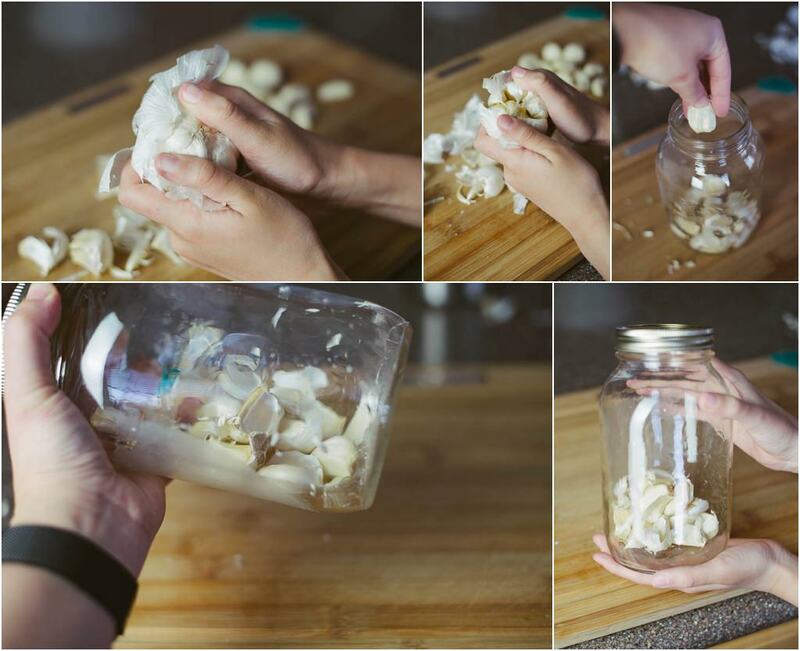 Once you are done open the lid of the mason jar, empty the cloves out on a cutting board and separate cloves from garlic peels. Use however much of garlic you need for your recipe and place the extra garlic either in a ziplock bag or in an airtight container. They will keep in the refrigerator for about 2 weeks. Make sure to use them up within that time frame. 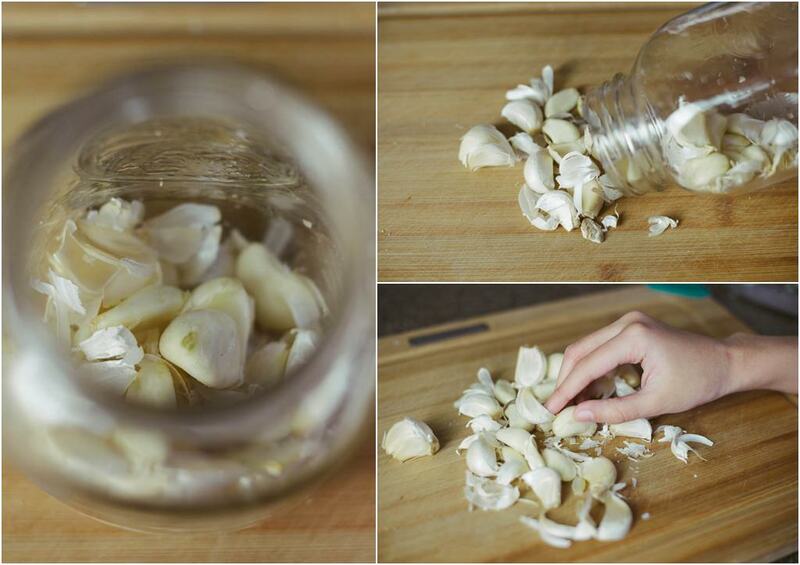 You can also freeze garlic cloves and use them for many months to come. But nothing beats fresh garlic, in my mind.